In 1911, Carrie Strahorn wrote a memoir sharing some of the most exciting events of twenty-five years of shaping the American West with her husband, railroad promoter and writer Robert Strahorn. Nearly ten years later, she's finally ready to reveal the secrets she hadn't told anyone—even herself. New York Times bestselling author Jane Kirkpatrick draws out the emotions of living—the laughter and pain, the love and loss—to give us a window not only into the past but into our own conflicted hearts. Based on a true story. The premise of this book is compelling, to think of what might have been left out of an adventure-filled memoir from the days of the Wild West. 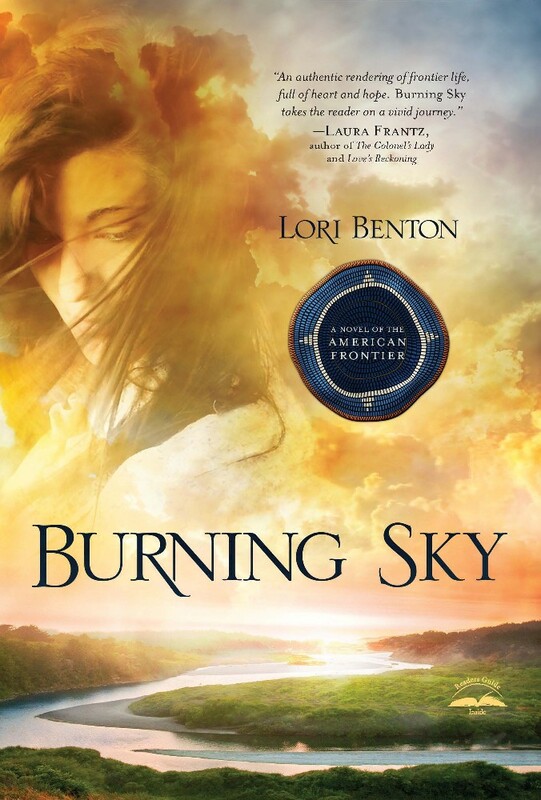 And the structure of this book is interesting, each chapter starting with a fictional journal entry, then continuing into scenes or memories told from the heroine's point of view, and ending with a quote from her actual memoir. 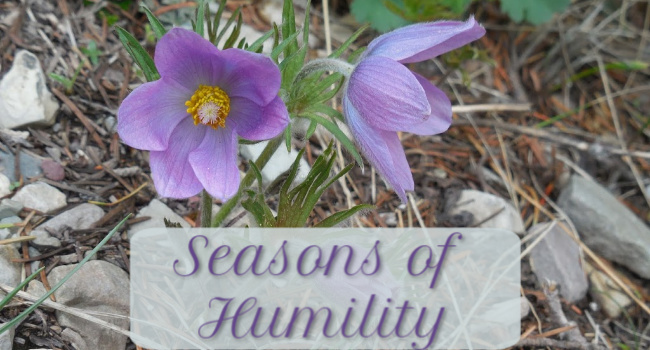 A lot of ground—a lot of life and time—is covered in this book. It takes a bit to get used to, and sometimes the narrative flows well and goes deep into a scene, while other times it soars quickly over the months or years. I wouldn't say this is necessarily my favorite way for a story to be told, but the writing and research are far from lacking. And as much as these characters, these people from history, are flawed like we all are, the tale of their travel-filled lives and unfulfilled longings does eventually sweep the reader away. I imagine such a reality-based story does limit an author... I might have wished for a happier ending or more growth in a certain character. The author includes a long note at the end that answers a lot of questions about what's fictional and what's not, which left me both satisfied and saddened. Everything She Didn't Say is a different sort of story that brings a woman from the past into relatable light, exploring her marriage, desires, hardships, and resilience. The faith element is definitely there, although it feels like the emphasis tends to rest a little more on Carrie's choices and attitude than the sustaining power of God. 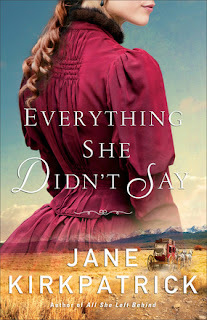 While I would say Jane Kirkpatrick's Kinship and Courage series (All Together in One Place, No Eye Can See, What Once We Loved) is more up my alley from what I recall, this is still an intriguing, thought-provoking, sobering, and admirable piece of historical fiction. 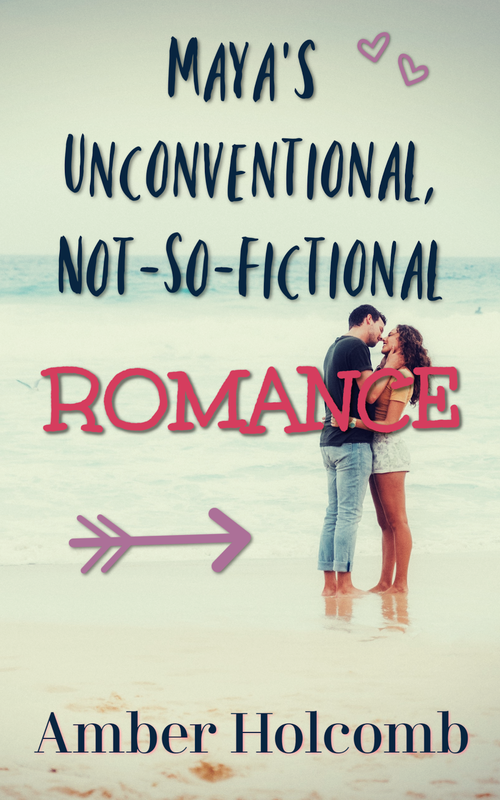 Announcing a Christmas Novella Blog Tour | Coming in November! Don't worry... I'm not ready to rush through autumn. 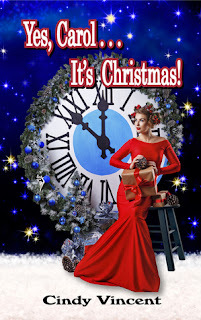 :) But in order to have enough preparation time, I'm pleased to announce sign-ups for a late November blog tour that's sure to get you in the Christmas spirit! As the top salesperson for Pfunn Party Supplies, Carol Frost doesn’t exactly know how to have fun herself these days. Though she wasn’t always such a humbug. Once upon a time, she was famous for hosting Christmas parties that were filled with everything from laughing guests and luscious hors d’oeuvres, to artfully iced sugar cookies and creatively decorated Christmas trees. To top it off, she even wrote a bestselling book that became the authoritative tome on Christmas party entertaining at the time—The Complete, Total, Ultimate, Everything-You-Might-Possibly-Want-to-Know Guide to Hosting the Best Christmas Parties Ever. Yet that was long ago, before her life changed and she stashed her tinsel and twinkle lights away once and for all. And while Carol soon learned to settle for her boring but comfortable existence, an old friend knows that Carol isn’t really living up to her potential. An old friend who . . . well . . . now enjoys her eggnog in the afterlife, you might say. To goad Carol into going back to her former party-hosting ways, said friend sends three of her specter pals to pester Carol. Then much to Carol’s annoyance, she is visited by the Ghost Hosts of Christmas Past, Present, and Future, on a plane filled with plenty of holiday revelers. And though Carol only wants to be left alone, the Ghost Hosts have other plans. Instead, they take her on an adventure that wasn’t exactly on her itinerary . . . or printed on her ticket stub. From that moment on, Carol’s life will never be the same. Provided, of course, she survives the jingle-bell rollercoaster of a ride and makes it home in time for Christmas . . .
CINDY VINCENT, M.A. Ed., was born in Calgary, Alberta, and has lived all around the US and Canada. She is the creator of the Mysteries by Vincent murder mystery party games and the Daisy Diamond Detective Series games for girls. She is also the award-winning author of the Buckley and Bogey Cat Detective Caper novels and the Daisy Diamond Detective series. She lives in Houston, Texas with her husband and an assortment of fantastic felines. 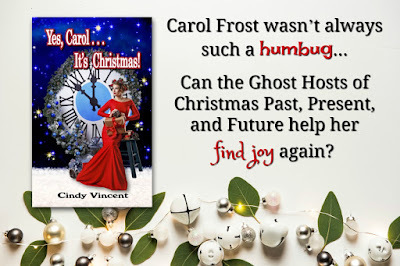 This is a fun Christmas-themed novella, a modern-day reimagining of A Christmas Carol by Charles Dickens. 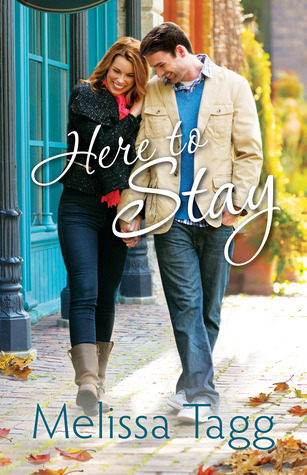 While the book is not specifically Christian fiction, the content is clean with only a small bit of romance. Happy (almost) autumn! You know I love the change of seasons around here. :) And you know I love talking about books! So, I'm diving into today's topic for Top Ten Tuesday: the books I want to read this fall. 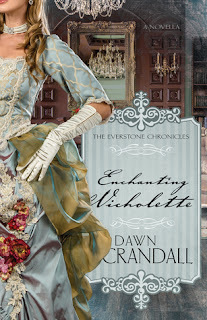 I've read several books by Dawn Crandall and was excited for an opportunity to review and share about her new novella. 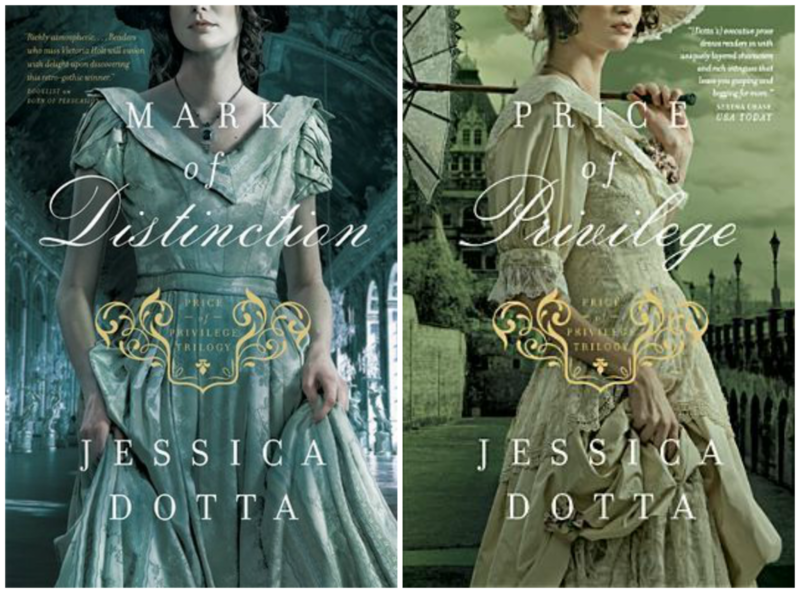 (My reviews of earlier books: The Hesitant Heiress, The Bound Heart, The Captive Imposter.) I'll be featuring this book on Twitter through a JustRead takeover tour in October and here on the blog in early November. Looking forward to it! 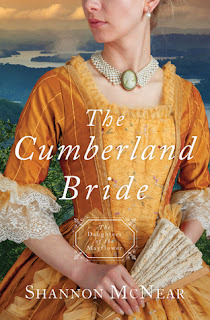 I've read a couple books so far in the Daughters of the Mayflower series (The Mayflower Bride and The Captured Bride). It's been fun to follow this series, and through NetGalley I have the opportunity to review the two latest additions as ebooks: The Cumberland Bride and The Liberty Bride. 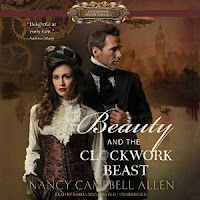 I read and loved Kiss of the Spindle (the second book in this steampunk romance series) this summer, and I'm eager to listen to the first book in the series! Everyone has been reading and talking about the first book in this series...including me! ;) (You can find my review of the audiobook here: To All the Boys I've Loved Before.) I enjoyed the Netflix adaptation too. 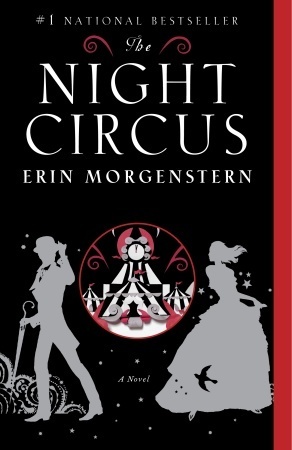 And since I like the narrator and characters...I'd like to continue the series with book two! 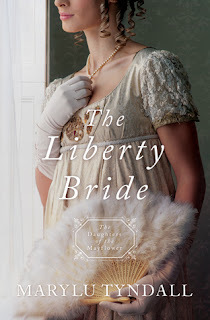 This book has been on my TBR for a long time, and I really want to finish it this fall! 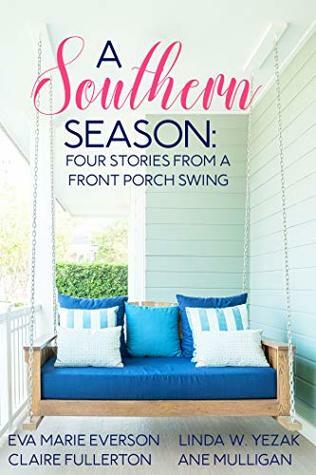 I adored The Pursuit of Tamsen Littlejohn, and I think this style/genre (like Laura Frantz's books) are perfect for this time of year. Another long-time TBR resident...and doesn't this look like a delightful autumn read? 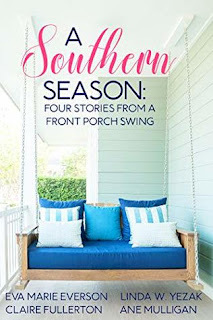 I really loved Melissa Tagg's first book (Made to Last), and I look forward to reading this one (hopefully this season!). 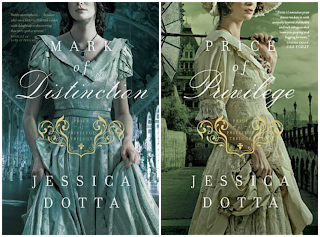 I finally read the first book in this series this past spring (Born of Persuasion), and it was really good! The darker, mysterious tone of these books would be great to finally enjoy this season. What are you most excited to read this fall? Any new releases? Or long-time TBR titles? Tressa Harlowe's father kept his vast fortune hidden somewhere on his estate in the south of England and died suddenly, without telling anyone where he had concealed it. Now Tressa and her ailing mother are left with a mansion and an immense vineyard and no money to run it. It doesn't take long for a bevy of opportunists to flock to the estate under the guise of offering condolences. Tressa knows what they're really up to. 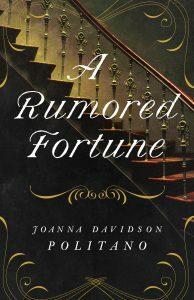 She'll have to work with the rough and rusticated vineyard manager to keep the laborers content without pay and discover the key to finding her father's fortune—before someone else finds it first. This was an interesting historical read! I liked the way each chapter starts with a bit of vineyard wisdom that applies to other areas of life. I enjoyed the light mystery (light in the sense of pace and perceived level of danger; the stakes certainly seem high enough to the heroine!). And the setting is intriguing, with plenty of nooks and clues and even wide open spaces to explore. Engaging while not necessarily "edge of your seat," A Rumored Fortune saves a handful of surprises for last, giving you time to guess and get to know the layered cast of characters. I wouldn't say the hero completely swept me off my feet, but the story still swept me away to a different time alongside a creative heroine who has some difficult lessons to learn and a heart needing to be given away. A "castle," a vineyard, men with hidden motives, a woman in harsh circumstances, and a treasure waiting patiently to be uncovered in the proper time... All of this makes for a great read that leads you smoothly along to the generally satisfying conclusion. Fifty dollars just for asking a few questions? Jedediah Jones figures it must be his lucky day. What dancing and doughnuts have to do with anything, he neither knows nor cares. He’s only interested in earning that money so he can finally eat something other than the apples he's been living off for days. Once his stomach and his pockets are filled again, he plans to move on. Can Jedediah Jones solve the mystery and earn that fifty dollars when the whole town has failed? Or will the twelve sisters lose their family's business no matter what he does? A fairy-tale retelling with a Wild West setting and a sweet atmosphere with just a dash of gentle suspense? I'll eat that right up, please and thank you! 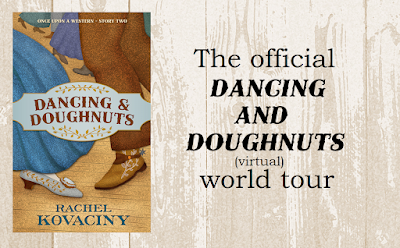 Dancing and Doughnuts is a quick story told from the perspective of a wandering man looking to make a few bucks before moving on. The strangest opportunity presents itself in the form of a "help wanted" ad, and our hero soon finds himself in a classy dance hall with unique refreshments, interesting characters, and a mystery no one seems able to solve. The mystery keeps the plot waltzing along at a nice pace, but what really made me fall in love with this story is its cleverness and voice. I absolutely love the way the author takes elements from The Twelve Dancing Princesses and makes them fit a historical setting in a way that feels both natural and enchanting. 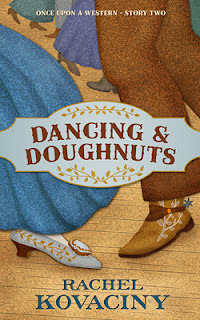 The descriptions of the dance hall and the events held there are especially delightful! Born only a few miles from where Jesse James robbed his first train, Rachel Kovaciny has loved the Old West all her life. 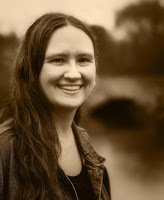 She now lives in Virginia with her husband and their three homeschooled children. 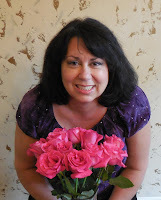 In her free time, Rachel writes for the magazines Femnista and Prairie Times, reads, bakes, blogs, watches movies, and daydreams. Her book Cloaked was a 2018 Peacemaker Awards finalist for Best Western YA/Children's Fiction. 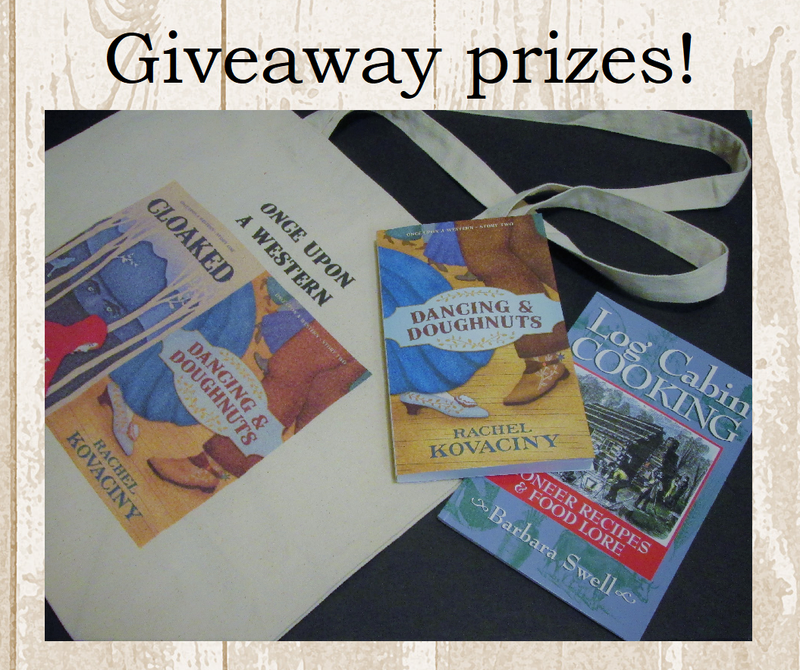 One winner will receive an autographed copy of Dancing and Doughnuts, a copy of Log Cabin Cooking, and a Once Upon a Western tote bag that measures 15" x 18" x 6" with 22" handles. You can enter in a variety of ways, including by visiting different tour stops each day! Rachel will draw one winner for the giveaway on Sunday, September 9 and notify them via the email address they provide to the Rafflecopter widget. Open worldwide.